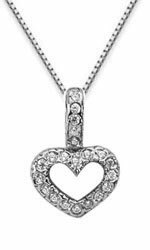 Almost a quarter carat of diamonds completely cover this sweet pendant, from the petite outline of a heart to the sparkling bale that holds it. These 22 diamonds encrust every visible surface of this glittering piece, creating the illusion that it's formed solely from these sparkling stones. This pendant reflects light in a lively manner as it dangles from the included 18-inch coordinating box chain, giving it a versatile sparkle that makes it a lovely gift for anyone who gives your heart a glow. Price includes an 18 Inch box chain. We guarantee our Diamond Heart Drop Necklace, 14K White Gold to be high quality, authentic jewelry, as described above.